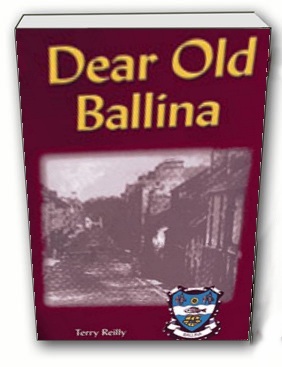 The history of Ballina and its environs. 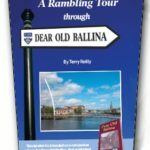 The foreword is written Mary Robinson, first woman President of Ireland, and a native of Ballina, who writes that the book is a historical record which tells the story of Ballina, and should be cherished by all its inhabitants and those with links with the town. 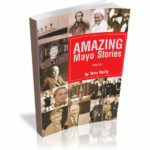 All phases of the town’s history are covered, going back over 5,000 years, and chapters sketch in the history of the Four Maols, stirring ancient battles, the Churches, Gunner McGee and the 1798 French Invasion, Fairs and markets, newspapers in the town, the Moy fishery and incredible salmon catches, Shipwrecks and loss of life on the sea, shipping through Ballina Port, Rack Rents and Food riots, Belleek Manor, The Hams of Ham Bridge, The Ballina Peacemaker at Eureka Stockade in Australia, General William Sewell who became a hero in the US, the dreaded Workhouse and the scourge of The Famine, Town Commissioners and Urban Council, the execution of Robert Emmett and local links, Town Gas and Light, the coming of the Railway, Seats of Learning, Industrial development, Stirring Parnellite Rallies, Ballina’s remarkable role in the Great War of 1914-18, Days of terror, Fight for Independence, the Irish Civil War, Fr. 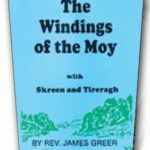 Patrick Peyton and the Rosary crusade, the amazing Lough Conn steeplechaser, local folklore, place-names and their meanings, etc. 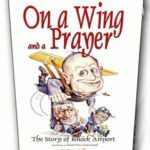 etc.. And much, much more.